This is another recipe I came across on Pinterest. It was called "slow cooker" recipe, but considering you have to cook the rice on the stove, I don't really consider it a slower cooker meal. So, as written below, it is not a slow cooker meal. Regardless, it was REALLY good--and my kids loved it, too! Cook the chicken breasts however you'd like (I boiled them, but you could cook them in the crock pot for a few hours). Cook the rice mix according to package directions. 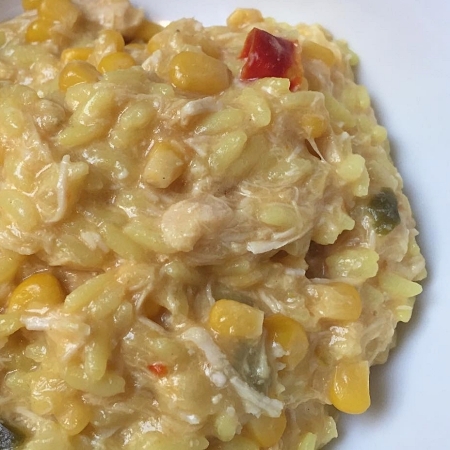 Shred the chicken when it's done cooking, and then combine the cooked rice mix, chicken, cream of chicken soup, corn, and cheese. It will be hot enough to melt the cheese. Makes 6 servings (approximately 1 cup each).